Adding even more punch to your home entertainment just got a lot easier with the Samsung Series 7 MS750 Soundbar Sound+ which is an all-in-one unit that will sound like you’ve got speakers everywhere. 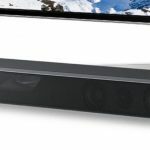 Tech Guide sat down to take a look at the MS750 which was connected to a Samsung 65-inch TV. 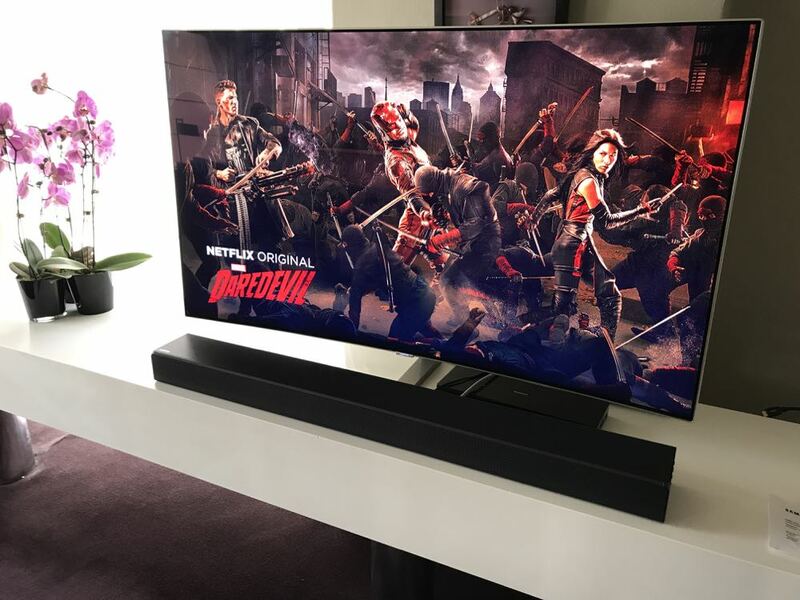 The soundbar is sleek and unobtrusive – it’s not going to get in the way of what you’re watching. You’ll forget it’s there after a while but you’ll definitely hear it and make you enjoy what you’re watching even more. 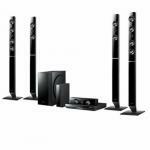 Now you could go out and buy numerous speakers and a receiver and connect them all together to achieve a respectable surround sound system but that will take a lot of time and effort – not to mention a fair amount of money. That scenario wouldn’t suit people who don’t have the room for a multi-speaker system or the desire to fill their house full of speakers. The Samsung Series 7 MS750 has 11 speakers built-in along with top mounted tweeters so you’re getting a full soundscape around you and above. Now it’s not quite Dolby Atmos but it does come close to its three-dimensional sound. 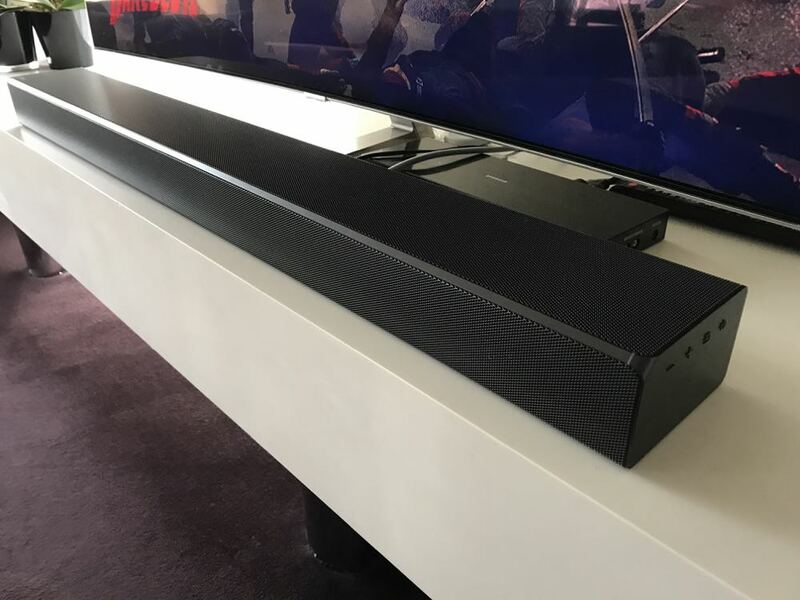 What sets the Samsung soundbar apart is its wider ranging audio footprint. Whether you’re sitting in front of the TV or off in the corner, you’re still getting the same impressive effect. For our testing, we sat in various positions around the room and the sound was as clear and sharp in each. So there’s no need to argue about who’s going to sit in the sweet spot – they’re all sweet spots. We watched a number of movies including Star Wars: The Force Awakens, Fury and The Fate of the Furious and it delivered beyond our expectations. Now we’d love to hear good sound but for us if it doesn’t have decent bass it’s not trying hard enough. 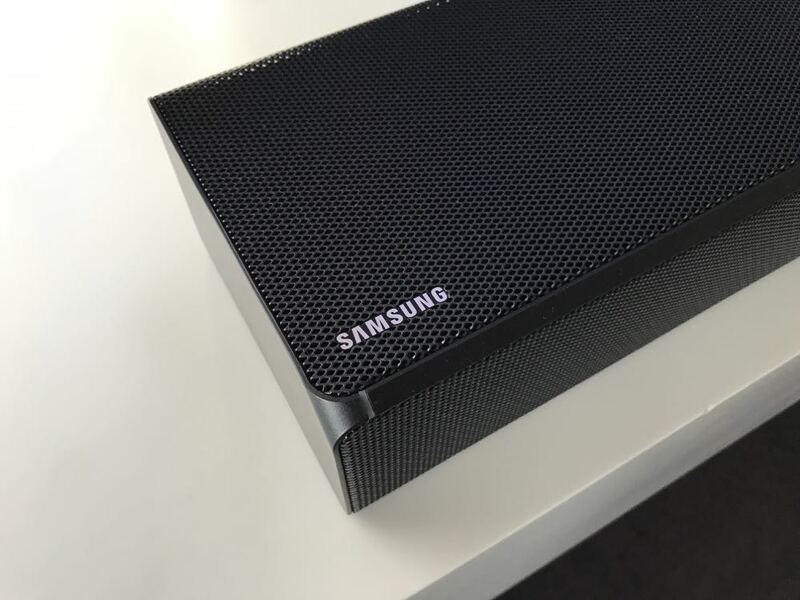 I was surprised to hear that the Samsung Series 7 MS750 also had the power to make it sound like there was a subwoofer in the room as well. The bass was surprisingly powerful, especially when watching action films, and it really gave the audio a lot more authority. This is due to the anti-distortion technology onboard which can predict and nullify the distortion before it happens. 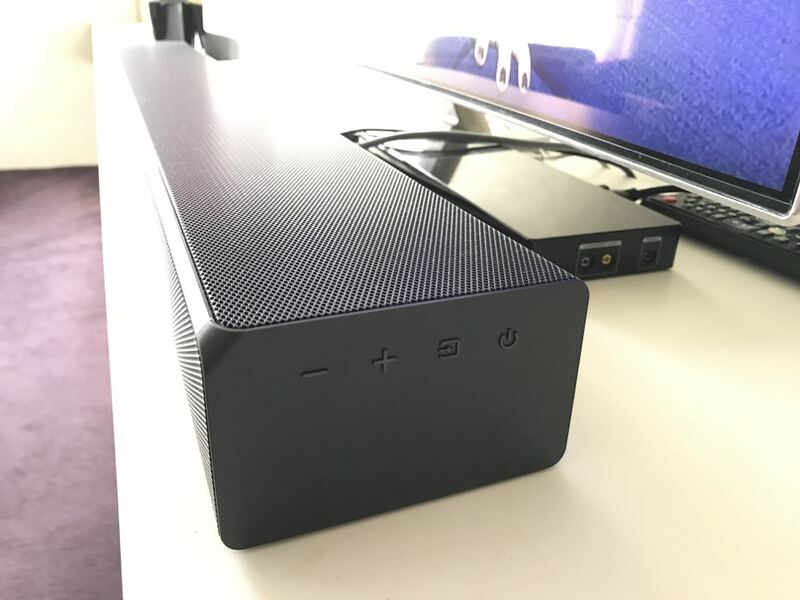 It’s possible to add a standalone subwoofer to the soundbar if you’ve got a larger room or just really love the added bass sound. You can also wireless rear speakers for an even more detailed multi-channel experience. But on its own MS750 stood its ground and sounded excellent. The soundbar is also smart enough to switch sound modes based on what you’re watching whether it’s sport, a movie or music. 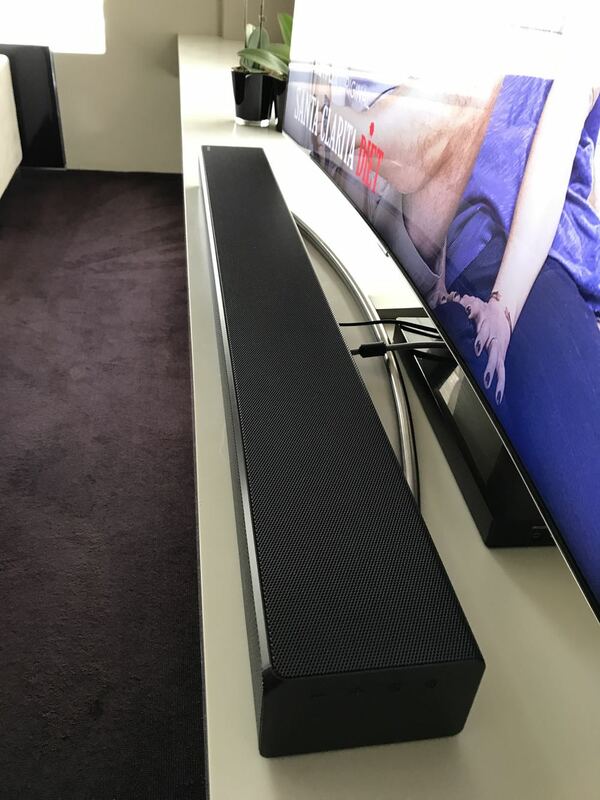 As a music speaker, the Samsung soundbar is also impressive. 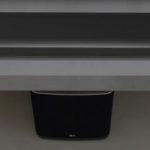 You can connect and stream via Bluetooth or set it up as another speaker in your multi-room system over wi-fi. And your music will sound better than ever thanks to the onboard 32-bit upscaling. 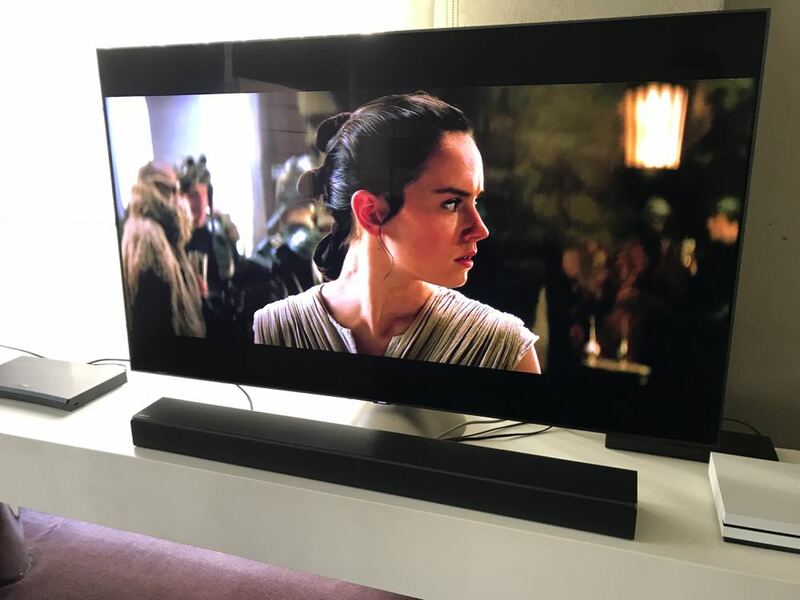 Connection is pretty simple with a single HDMI cable to your 4K TV and it also has 4K passthrough so you can also connect your 4K UHD Blu-ray player. 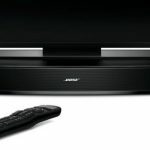 The Soundbar MS750 has a remote that can control your volume and power so you don’t need multiple remotes and if you’ve got a compatible Samsung TV you can also access the TV’s interface as well. 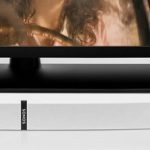 The Samsung MS750 Soundbar Sound+ is a game-changer so you can easily improve the audio quality you can get from your TV and elevate your home theatre experience. PROS: Excellent sound, surprising bass power, easy-to set up, handy remote, impressive music play with 32-bit upscaling. CONS: Will seem expensive for some. Needs additional rear speakers for better surround sound. 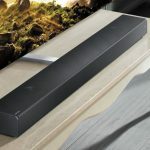 VERDICT: The Samsung MS750 Soundbar Sound+ is a game-changer so you can easily improve the audio quality you can get from your TV and elevate your home theatre experience.